ISLAMABAD: A cost of 969-megawatt run of the river Neelum-Jhelum Hydropower Project has increased to Rs 500 billion and the Water and Power Development Authority (WAPDA) has forwarded revised PC-1 of the project to the Water and Power Ministry for a further necessary process in this regard. Official sources at the WAPDA, on condition of anonymity, informed that the fourth increase in the cost of the hydropower project had been made in 2002 and a revised project component (PC) was sent to the power ministry for a further necessary process. They said the cost of the project after the fourth increase has reached Rs 500bln. And, all electricity consumers would pay Neelum-Jhelum surcharge during the current year while so far the surcharge contributed about Rs70bn, sources added. The Neelum-Jhelum surcharge of 10-paisa per unit was originally imposed in 2007 when the Neelum-Jhelum project cost was approved at Rs130bln with a sunset clause of Dec 31, 2015. At that time it was envisaged by the concerned quarters that half of the financing would be generated through this surcharge on every unit of electricity sold to consumers in eight years. However, the cost of 969-megawatt run of the river project in Azad Kashmir kept on increasing with latest estimates at Rs500bln for targeted completion in 2018. The 10-paisa per unit surcharge was extended for one year up to Dec 31, 2016 when the total cost was approved at Rs404bn early last year. Surprisingly, the cost estimates for the project had been jacked up four times since 2002 when the cost estimate was set at Rs84.5bln. But, it was revised to Rs277.5bln in 2012 to accommodate changes in design and geography caused by 2008 earthquake in AJK. This was followed by revised cost approval of Rs404bln in 2015 and now in 2017 Rs500bln cost of the projected is estimated. The sources further pointed out that per unit cost of the project which was originally estimated at about Rs3-4 per unit was now being worked out at Rs12-13 per unit with effect to latest increase in the total cost of the project. They said so far financial close of the project could not take place and power consumers paid heavy brunt of it in the form of surcharge. The surcharge was, however, not applicable to the consumers of K-Electric. On completion, the project would be capable of producing 5.15bn units of electricity each year. 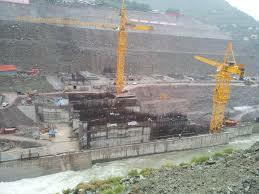 This mega hydropower project has been undertaken long after completion of Mangla and Tarbela dam projects. Reportedly, the Pakistan Muslim League-Nawaz (PML-N) government was expecting the first unit of the project to become operational by July 2017, followed by subsequent units every quarter, to reach 100pc operation by January 2018, in accordance with the agreement signed with the Chinese contractor in December 2007. Work started in May 2009 and was to be completed in eight years. However, the project is now expected to bring its first unit to operations at the end of February 2018 and the other three turbines before the start of next summer, extending the completion date by seven months. The full capacity would be available for use by May 2018.